The pancreas is a retroperitoneal organ situated deep within the abdomen and not easily accessible by physical examination. Pancreatic pathologies have a variety of presentations, which make their diagnosis challenging to physicians.1 Imaging plays a critical role in the evaluation of pancreatic diseases and provides valuable information to clinicians, thereby dictating crucial management decisions. Technological advancements in multidetector computed tomography (MDCT) and magnetic resonance imaging (MRI), coupled with innovations in 3-dimensional(3D) imaging capabilities, have revolutionized the role of imaging in managing patients with pancreatic disorders. 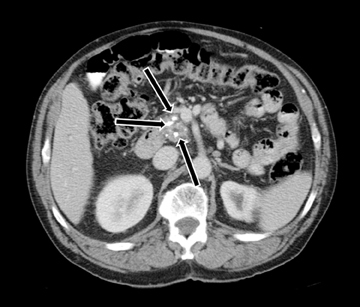 Imaging is most often performed to manage patients with pancreatitis and suspected pancreatic mass lesions. 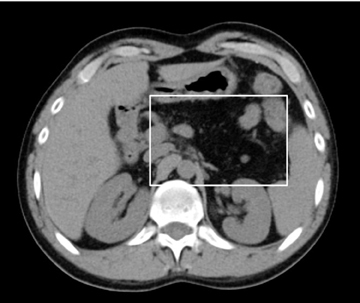 In Part 2 of this article, available on www.appliedradiology.com, the discussion continues regarding imaging manifestations of various abnormalities affecting the pancreas as they relate to specific types of pancreatitis, pancreatic neoplasms, and tumors. The pancreas has two distinct functions, endocrine and exocrine. Eighty to 95% of the pancreatic parenchyma is composed of acinar cells, which are dedicated to the exocrine functions of producing and secreting digestive enzymes, such as trypsinogen, lipase. and amylase.3 It is curious to note that while the overwhelming majority of the pancreatic parenchyma is composed of acinar cells, acinar cell carcinoma is an extremely rare subtype of pancreatic carcinoma (< 1% of all pancreatic tumors).4 Only 5% to 20% of the pancreatic parenchyma is responsible for the endocrine function, composed of cells clustered into Islets of Langerhans, which produce hormones, such as insulin, glucagon,and somatostatin. 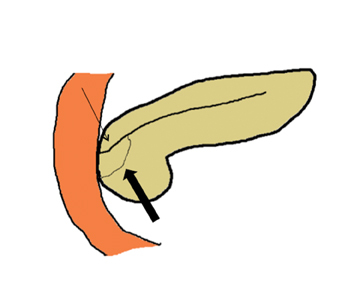 Embryologically, the pancreas arises from a dorsal and ventral pancreatic bud. The larger dorsal bud is the precursor of the anterior portion of head as well as body and the tail, while the smaller ventral bud develops into the posterior head and uncinate process. 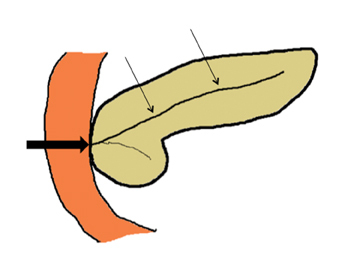 The dorsal and ventral ducts fuse into one major duct, the duct of Wirsung, which empties into the duodenum along with the common bile duct at the ampulla of Vater.1 Variations in the pancreatic ductal branching pattern are common (Figure 1). 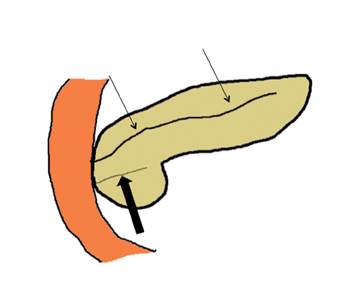 One common variant is the presence of an accessory pancreatic duct, known as the duct of Santorini, which empties into the duodenum separately from the main pancreatic duct via the minor papilla, which is superior to the ampulla. Another variant is the so-called dorsal dominant drainage, where the duct of Wirsung empties into the minor papilla and the duct of Santorini empties into the major papilla. This is similar to pancreas divisum, which is present in about 10% of normal individuals. 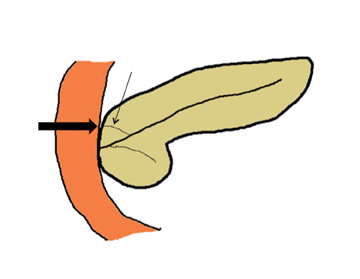 However, in the pancreas divisum, there is complete separation of the dorsal and ventral pancreatic ducts.5 An association between the pancreas divisum and pancreatitis is described and is believed to be due to the relative obstruction of the dorsal pancreatic duct, which carries digestive enzymes from the majority of the gland and empties through smaller minor papilla.6 This, however, is controversial and other authors believe that pancreas divisum is not causative in pancreatitis, but rather only associated with other known genetic causes of acute and chronic pancreatitis, such as CTFR, SPINK1, and PRSS1 associated mutations.7 Annular pancreas can result during rotation of the ventral pancreatic bud as it fuses with the dorsal bud, resulting in a ring of pancreatic tissue encircling the duodenum, causing gastric outlet obstruction in infants and pancreatitis in adults (Figure 2). Radiography has a limited role in imaging of the pancreas, but it can sometimes depict parenchymal calcifications, which helps in the detection of chronic pancreatitis. However, punctate calcifications near the pancreas can be confused with splenic artery calcifications. 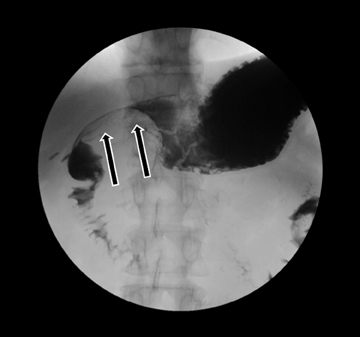 In patients with pancreatitis, several plain radiographic features have been described, including the so-called ‘colon cutoff sign,’ characterized by abrupt termination of colonic gas shadow at the splenic flexure. Ultrasound (US) also has a limited role in pancreatic evaluation as the overlying gas from the transverse colon and stomach makes visualizing pancreatic parenchyma difficult or even impossible. However, US can help identify gallstones as an etiology in patients with pancreatitis and biliary ductal dilation in patients with a pancreatic head mass. Most focal pancreatic lesions are hypoechoic compared to normal parenchyma. The advent of endoscopic US (EUS), has added a new dimension as it provides ultra-high resolution images and exquisite details of pancreatic tumors, particularly in cystic lesions. Additionally, EUS allows simultaneous tissue sampling of pancreatic lesions withEUS-guided fine needle aspiration (FNA). 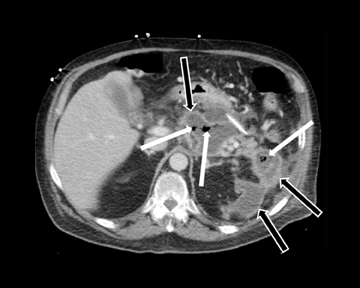 However, the acquisition and interpretation of these images are usually performed by interventional gastroenterologists and are not within the scope of this article. MDCT is the modality of choice for the evaluation of both inflammatory and neoplastic conditions of the pancreas.2 In inflammatory conditions, MDCT not only provides excellent visualization of the parenchymal abnormalities, but clearly depicts the extrapancreatic spread of disease. In pancreatic neoplasms, MDCT accurately depicts the tumor morphology, ductal anatomy, and its relationship to surrounding organs and vascular structures. Thin-section MDCT in combination with image-processing techniques (multiplanar reconstructions and curved reformations) can provide additional imaging details and can define the pancreatic ductal anatomy. The specific MDCT imaging protocol depends on the clinical question to be answered. A typical MDCT protocol for pancreatic evaluation involves administration of oral and intravenous contrast (Table 1). 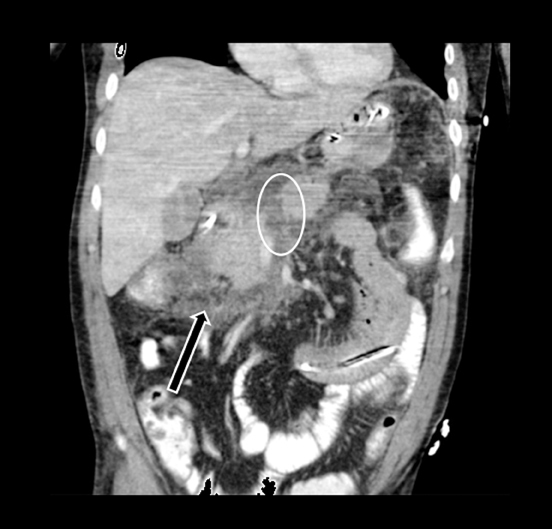 For routine indications, including pancreatitis, a portal venous-phase abdominal CT with positive oral contrast medium (POCM) provides the most information. 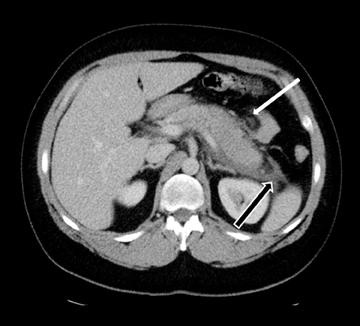 However, for a dedicated pancreatic protocol CT, neutral oral contrast media (NOCM) like water are preferred, as they allow superior image reconstruction.8 In patients with suspected pancreatic mass,a focused pancreatic protocol CT is performed, which includes a pancreatic, portal venous, and a delayed phase through the liver to assess for hepatic metastases. An arterial phase may be performed in place of a pancreatic phase if a hypervascular pancreatic lesion like a neuroendocrine tumor is suspected. Pancreatic phase refers to the late arterial phase (typically 40-45 sec after contrast injection) during which there is maximal differentiation between the normal parenchyma and hypodense pancreatic tumors like adenocarcinoma. This phase also provides optimal arterial and mesenteric venous opacification, which allows assessment of vascular involvement, thereby permitting surgical planning by evaluating potential tumor resectability. Arterial opacification in this phase limits the need for a separate dedicated arterial phase. Accurate contrast timing for image acquisition during various phases can be achieved using the test bolus or the automatic bolus triggering technique. Magnetic resonance imaging (MRI) with cholangiopancreatography (MRCP) has emerged as a reliable tool for accurately characterizing pancreatic pathologies. The superior soft-tissue and contrast resolution inherent to MRI makes it a superior test for assessing the morphologic features of pancreatic tumors particularly in pancreatic cysts. MRCP provides excellent 2-dimensional (2D) and 3-dimensional (3D) depiction of the pancreatic duct anatomy and its abnormalities in patients with pancreatitis as well as neoplasms. Typical imaging sequences used include axial T1-weighted images, with and without fat saturation, using breath-hold or gated respirations. A complete evaluation of the pancreatic parenchyma and pancreatico-biliary ductal system can be performed with the following sequences: T1-weighted gradient echo, T2-weighted (T2W) axial, and coronal sequences, either fast spin echo (FSE) or turbo spin echo(TSE), 2D and 3D MRCP; and T1-weighted 3D gradient-echo before and after gadolinium. To adequately visualize the gallbladder and to assess the exocrine response to secretin, the patient should ideally be fasting for 4 hours. Negative oral contrast is administered to reduce the signal from the overlying stomach and duodenum. Axial and coronal T2 images with and without fat saturation should also be obtained.Dynamic postcontrast images should be obtained 25, 70, and 120 sec after the gadolinium contrast injection. Ideally, field strength should be≥ 1.0 Tesla with fast imaging sequences. A standard pancreatic protocol also includes MRCP images for further evaluation of pancreatic ductal abnormalities. The MRCP sequence can be obtained as 2-dimensional (2D) or a 3-dimensional (3D) acquisition. 3D MRCP produces high resolution images of the pancreato-biliary ductal anatomy as the thin sections without slice gap of a 3D technique allows better assessment of small stones, side branches of the main pancreatic duct, and intrahepatic bile ducts. The 2D MRCP is acquired either as a thick-slab, single-shot,fast spin echo T2W sequence or a multisection, thin-slab, single shot FSE T2W sequence. The 3D fast spin echo sequence can either be acquired as a series of breath holds or during free breathing. Secretin MRCP is a modified MRCP sequence, which entails administration of secretin to stimulate the exocrine function of the pancreas. Secretin MRCP is useful in assessment of complex ductal anomalies and to quantitatively or semiquantitatively assess the exocrine function of the pancreas. Acute pancreatitis refers to acute reversible inflammation of pancreatic parenchyma. Approximately 200,000 patients with this condition are admitted to the hospital each year in the United States (U.S.).10 It is triggered by premature activation of digestive enzymes within the pancreatic parenchyma, leading to digestion of pancreatic andperipancreatic tissues. The etiology for acute pancreatitis includes gallstones (40%), alcohol abuse (30%-35%), andidiopathic causes (20%). Other etiologies include mechanical (post ERCP, trauma), metabolic (hypercalcemia, hypertriglyceridemia, cystic fibrosis, and hereditary pancreatitis) and toxic (drugs like HCTZ and aspariginase).1 The overall mortality rate for pancreatitis is 2% to10%, but most (70%-80%) patients experience mild or edematous pancreatitis, which is typically a self-limiting disease with a mortality of< 1%. On the other hand, approximately 25% of patients experience severe pancreatitis, which is associated with high morbidity and a mortality rate between 10% and 23%. The dichotomy between these two outcomes is highly correlated with the presence or absence of pancreatic necrosis, which is seen in nearly 20% of all cases.11 Pancreatic necrosis is caused by disruption of the microcirculation via necrotizing vasculitis and thrombosis and is an important prognostic indicator. Mortality rises with the degree of pancreatic necrosis and mortality rates of > 50% are seen when necrosis involves > 30% of pancreatic parenchyma.12 The necrotic tissue can get secondarily infected due to translocation of gut flora and is nearly always fatal if untreated.13 The treatment typically entails surgical debridement or percutaneous drainage. 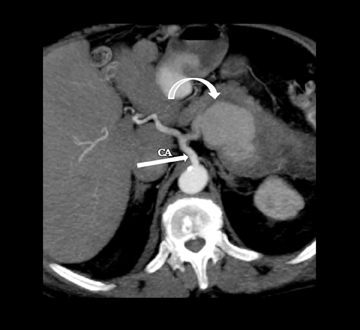 MDCT is the preferred imaging modality and contrast administration is essential to detect complications, such as parenchymal necrosis, venous thrombosis, and arterial pseudo-aneurysm. 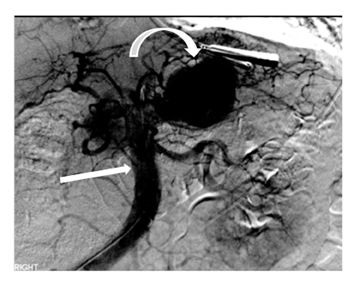 A single portal venous phase abdominal MDCT is performed for routine cases,but arterial phase scanning is imperative when pseudoaneurym is suspected. 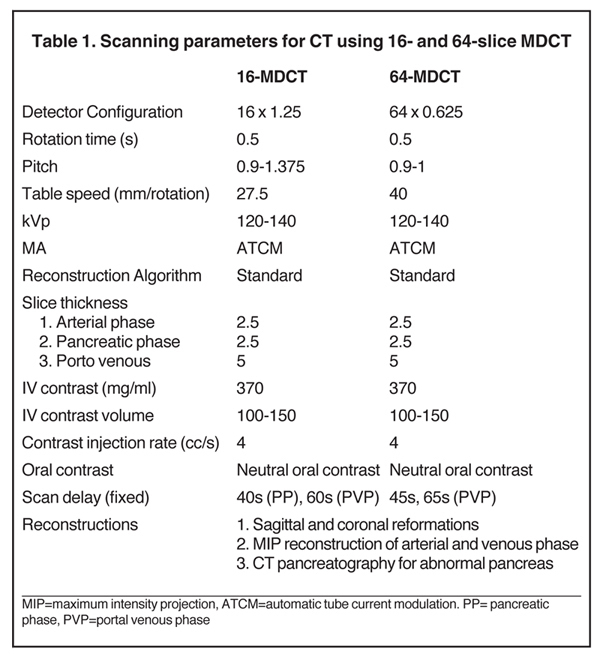 The range of pancreatic findings and the CT grading is depicted in Table 2. Mild or early pancreatitis (Grade A) is occult on CT and the imaging findings lag behind the clinical and laboratory findings. Grade B pancreatitis is characterized by diffuse or focal pancreatic enlargement, while peripancreatic inflammatory changes,including blurring of the pancreatic margin, stranding of adjacent fat, and mild decrease in parenchymal density from edema occur inGrade C pancreatitis (Figure 4). Thickening of the anterior renal fascia (Gerota’s fascia) is also seen and is an early and sensitive indicator of peripancreatic inflammation. MRI is typically performed for evaluation of etiologies, such as gallstones or pancreas divisum. The imaging findings include loss of normal T1 hyperintensity with heterogeneous hypointense areas. T2 fat-suppressed images may show small amounts of peripancreatic fluid. 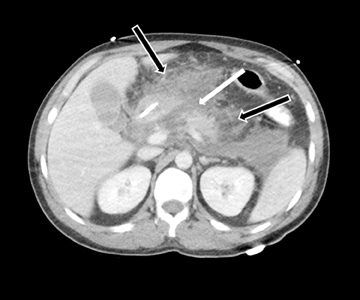 Acute fluid collections often occur in patients with pancreatitis, and the presence of fluid collections increases the CT pancreatitis grade. Pseudocysts are the most common inflammatory cystic pancreatic lesions and contain necrotic debris from digested retroperitoneal fat. While their definitive diagnosis requires aspiration of contents to show a high amylase level, a preceding history of pancreatitis with the typical imaging features, such a fluid collection with a distinct fibrous capsule persisting for > 4 weeks allows for a confident presumptive diagnosis. Pseudocysts can have myriad imaging appearances ranging from unilocular to multilocular morphology. Enhancement of the cyst wall is commonly seen on MDCT. On MRI, they typically show variable but low signal on T1-weighted images and high signal on T2-weighted images. Hemorrhage and debris can cause an atypical appearance leading to an increased T1 signal and decreased T2 signal compared to simple appearing pseudocysts. 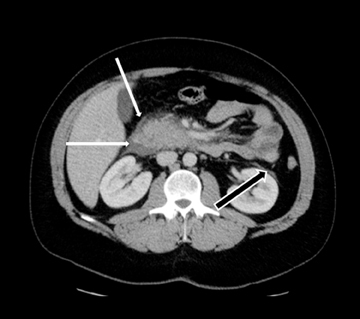 Many pseudocysts demonstrate communication with the main pancreatic duct, best seen with either ERCP or MRCP.2 Pseudocysts are typically treated conservatively unless complications, such as mass effect, infection, and rupture leading to peritonitis, arise (Figures 6 and 7). Gas within a pseudocyst does not prove infection; this imaging finding could also be due to enteric fistula or recent intervention. Percutaneous, endoscopic or open surgical drainage are treatment options. Leakage of the digestive pancreatic enzymes can cause digestion of the wall of the surrounding arteries leading to weakening and pseudoaneurysm formation (Figure 8). The splenic artery is most commonly involved, followed by the gastro-duodenal artery, celiac artery, orSMA. They are at a high risk for hemorrhage and urgent surgical or vascular interventional radiology evaluation is needed. Pancreatic and peripancreatic inflammation can extend to surrounding venous structures leading to thrombosis, which manifests as a filling defect within the affected vessel during the portal venous phase. Chronic pancreatitis, which results in irreversible fibrosis, atrophy, and exocrine and endocrine insufficiency of the pancreas, may manifest clinically as malabsorption and diabetes. Hrubran R, Wilentz R. The Pancreas. In: Kumar V, Abbas AK, Fausto N, eds. Robbins and cotran pathologic basis of disease 7th Ed. Philadelphia, PA: Elsevier Saunders; 2005:939-953. Leyendecker JR, Oliphant M. Pancreas. In: Dalrymple NC, Leyendecker JR, Oliphant M, eds. Problem solving in abdominal imaging. Philadelphia, PA: Mosby Elsevier; 2009. Marino C, Gorelick F. Panceatic and salivary glands. In: Boron W, Boulpaep E eds. Medical physiology: A cellular and molecular approach. Philadelphia, PA: Elsevier; 2005: 908-926. Mulkeen A, Yoo, P, Cha C. Less common neoplasms of the pancreas. World J Gastroenterol. 2006;12:3180-3185. 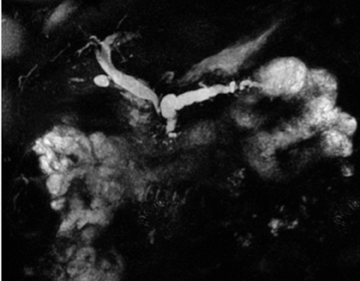 Roth CG, Deshmukh S. MRI of the pancreaticobiliary system. In: Roth CG ed. Fundamentals of body MRI. Philadelphia, PA: Elsevier Saunders; 2012: 129-199. Shanbhogue A, Fasih N, Surabhi V, et al. A Clinical and radiologic review of uncommon types and causes of pancreatitis. Radiographics. 2009;29: 1003-1026. Pezzilli R. Pancreas divisum and acute or chronic pancreatitis. JPancreas. 2012;13:118-119. 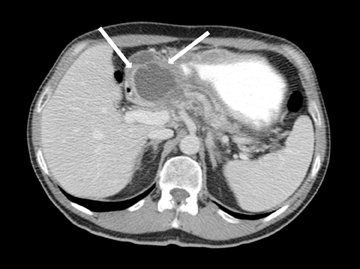 Brennan DD, Zamboni G, Raptopoulos V, Kruskal J. Comprehenisve preoperative assessment of pancreatic adenocarcinoma with 64-section volumetric CT. Radiographics. 2007;27: 1653-1666. Balthazar EJ. 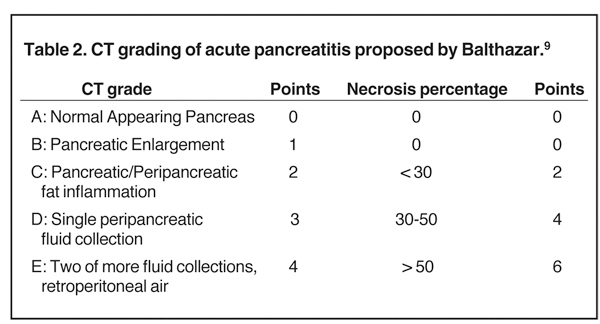 Acute pancreatitis: Assessment of severity with clinical and CT Evaluation. Radiology. 2002;223:603-613. Singla A, Csikesz N, Simons J, et al. National hospital volume in acute pancreatitis: Analysis of the nationwide inpatient sample 1998-2006. HBP (Oxford). 2009;11:391-397. Baron TH, Morgan DE. Acute necrotizing pancreatitis. N Engl J Med. 1999;340:1412-1417. Balthazar EJ, Robinson DL, Megibow AJ, Ransson JH. 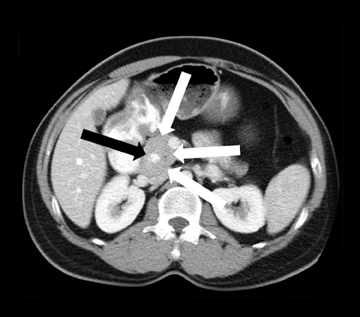 Acute pancreatitis: Value of CT in establishing prognosis. Radiology. 1990;174:331-336. Banks PA. Infected necrosis: Morbidity and therapeutic consequences. Hepatogastoenterology. 1991;38:116-119. Leung TK, Lee CM, Lin SY, et al. Computed tomography severity index is superior to Ranson criteria and APACHE II scoring system in predicting acute pancreatitis outcome. World J Gastroenterol. 2005;11:6049-6052. Braganza J, Lee S, McCloy R, McMahon M. Chronic pancreatitis. Lancet. 2011;377:1184-1197. Imaging of the pancreas: Part 1. Appl Radiol. Dr. Quencer, Dr. Kambadakone, Dr. Sahani, and Dr. Guimaraes are at the Division of Abdominal Imaging and Intervention, Massachusetts General Hospital, Boston, MA.